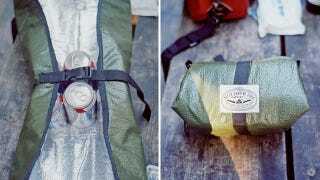 Your typical white Eskimo cooler is a cheap way to keep drinks cold and food warm or cold, but it's not very flexible. And its boxy shape is downright awkward when compared to the Wunder Bundler—an insulated blanket that can wrap up anything from a six-pack of beer to a stack of Chinese takeout containers. At $25 it's a lot cheaper than that so-called "ultimate cooler," and with many more uses. Made from waterproof materials, it's great for use as a dry seat on a wet outdoor surface, as an impromptu baby-changing pad, or a wrap to stuff a wet swimsuit in a beach bag. The reflective material on the inside can even be used to signal for help in an emergency—like, say, that time you drank six beers in the woods and got lost. If they had Wunder Bundlers in The Hitchhiker's Guide to the Galaxy, you probably never would have been told to bring a towel. Don't leave home without it.